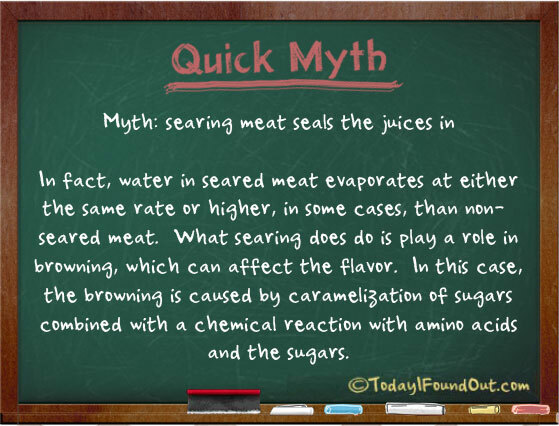 Searing Meat Does Not "Seal in the Juices"
Myth: Searing meat seals the juices in. In fact, water in seared meat evaporates at either the same rate or higher, in some cases, than non-seared meat. What searing does do is play a role in browning, which can affect the flavor. But, in this case, the browning is caused by caramelization of sugars combined with a chemical reaction with amino acids and the sugars. Please cite and research your sources better. The only evidence cited for this “fact” is hidden in a wikipedia page, a single source whose book was quoted from one page, meaning that we cannot check the evidence without buying his book. I’m assuming you did not read the actual evidence, and presented it as a fact anyway. In reality, there is debate over the effect of searing meat prior to further cooking. Some people think it seals in juice, some don’t. @CStanley: “I’m assuming you did not read the actual evidence, and presented it as a fact anyway” I understand your skepticism as most “fact” sites out there are filled with false facts, demonstrating the author’s lack of caring about being factual and being more about just creating a new post for search engines and people to look at who most of which won’t bother to look into things for themselves. However, I started this site to provide a place where people could go and know what they are reading is actually true, at least as far as we know from the current state of human knowledge. It takes a lot longer on my part to research things, but I enjoy research and I do this for a living, so I take it very seriously. I won’t say I’ve never been wrong on this site, but it doesn’t happen often and you’d be hard pressed to find a more accurate fact site on the internet. “The eminent German chemist Justus von Liebig came up with this idea [searing meat to seal in the juices] around 1850. It was disproved a few decades later. Yet this myth lives on, even among professional cooks. Now, if you could find a scientifically done study on searing vs. juice retention that shows it actually really does “seal in the juices” somehow, despite that browned meat isn’t waterproof and the fact that water loss in meat is directly proportional to the temperature it’s cooked at, I’d be happy to revisit this and possibly remove the quick myth, but I couldn’t find one, only subjective data, and I searched for quite some time. 🙂 What I did find that wasn’t subjective was that numerous such experiments have been performed (easy enough to do yourself even with a simple kitchen scale) and in every single case the seared meat had the same or less moisture than the non-seared meat.